Every brand carries a story and so does St. ERHARD. This history of brewing beer is thousands of years old and Bamberg area in particular has a rich cultural and beer heritage. The story of Saint Erhard is the story of a prominent Bavarian saint who missionized Bavaria in the 7th century. With St. ERHARD beer we now want to missionize the Asian beer market and make St. ERHARD become the synonym of German premium beer abroad. St. ERHARD is a flagship brand which represents true beer excellence. This process starts right from the production of our clear glass bottles with our logo getting printed directly on them. This gives our bottles a different grace & subtleness. Then the bottles are coated with an UV-protection to preserve the beer from the effects of sunlight. This makes our beer very attractive and trendy when it comes to our product design and brand promotion. St. ERHARD was founded in 2011 by Christian, Vincent, Thies & Vikanshu. Even though German beer carries a great reputation in India, there was rarely any brand present in India. This is how the idea of St. ERHARD got generated. Creating a premium brand all from scratch and making it prominent among the beer enthusiasts all over the globe is our vision. St. ERHARD is a Kellerbier also called cellar beer in English. It’s brewed according to the German purity law (Reinheitsgebot) and only water, hops and malt are used. The different malts used are Vienna, Pilsen and Cara-Munich malt and the hop used is called Tettnanger aroma hop. 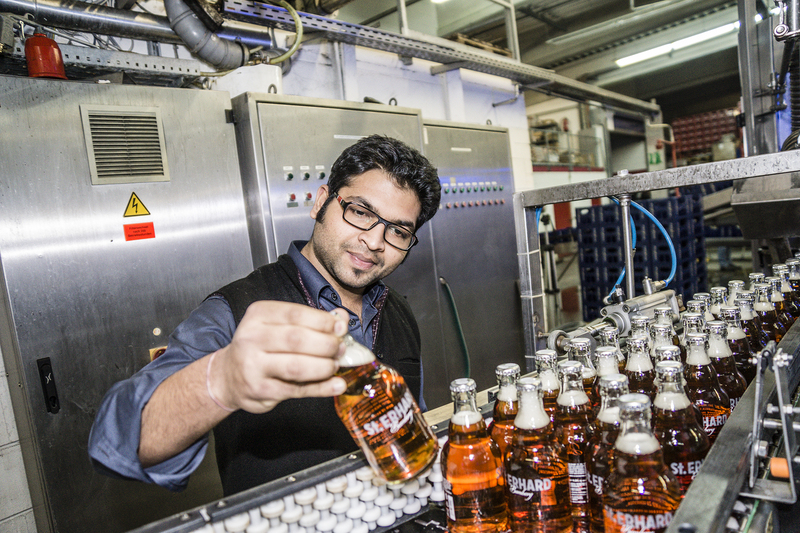 A batch of St. ERHARD beer takes approximately 3-4 weeks to get ready and to be bottled. The bottles of St. ERHARD are closed with a crown cap that is separately printed with the picture of Saint Erhard. During this process the beer is also tasted by the brewmaster. Taste and quality is fully taken care of. Then the finished bottles are ready to be exported via containers to India and other parts of Asia. There are a lot of passionate people behind this brand. As I like to say every sip of St. ERHARD tells me a story.